Duncan Weir didn’t feature in that classic Edinburgh-Harlequins last October but felt as drained by the end of it as any of those who took part. The stand-off was recovering from his fractured jaw and was in the water boy role that afternoon, a job which kept him on his toes in a game which delivered 11 tries and a thrilling 36-35 win for Edinburgh which stands out as a shining moment in what has been a testing season. Weir is hoping the return match in European Challenge Cup Pool 5 at Twickenham Stoop tomorrow brings similar positive vibes, though perhaps in a less heart-stopping manner than the previous meeting which was decided by a last-gasp Tom Brown touchdown. “I was coming back from my jaw injury, running water and my blood pressure was going through the roof at times,” recalled Weir. “It was a great day. I remember the atmosphere afterwards, with really positive celebrations bringing people together. “We’ll need a similar effort on Saturday to get the same feelings. “I remember some amazing tries scored on the back of turnovers. We were really sharp in punishing Quins. I remember watching from the touchline and at just 20 minutes into the game both teams were absolutely gone, they were gubbed. “Both teams were playing a lot off turnover ball and there wasn’t a lot of set pieces to slow things down. Hopefully the lungs won’t be as broken up as in the first game. We’re all refreshed after having last weekend off and hopefully we can have a bit more structure in the game. “They will want to play a tidier game after we showed them that sharpness. It will be a tough game as Quins are a quality side with a strong squad. Going to the Stoop will be a tough challenge, but one that we feel confident about. The Londoners go into the game on 17 points, two ahead of Edinburgh, aware that a bonus-points win would be enough to secure them qualification. 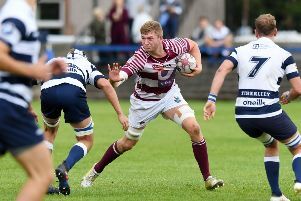 The Scots know that a win for them would all but seal their progress, with Romanian makeweights Timisoara first-footing the new home at Myreside next weekend. “It’s massive. If we can go down there and get a victory it is almost half a step into the quarter-final, which would be great for Scottish rugby and Edinburgh,” added the former Glasgow Warriors playmaker. “It’s a huge game. If we win that we are bringing our first game to Myreside with a real purpose to go out and do a job and get into the last eight, which would be great. “They’ll be targeting it the exact same way. If they win then they are half a step closer to getting into that last eight. Edinburgh come into the game after a week off due to their scheduled Pro12 tie against Munster being re-arranged to accommodate the Irish side’s trip to Racing 92 in the Champions Cup, which was postponed due to the death of Anthony Foley last year. Following a loss in the first 1872 Cup clash at home to Glasgow there has been a Hogmanay win at Zebre and Weir feels the squad are in good shape for their first taste of 2017 action. Weir and his team-mates trained at Myreside yesterday and there is a hope that the move to the new home can breathe some life into the campaign, with the stand-off targeting progress in both the Pro12 and Europe. “We’ve got a huge focus on getting out of this pool,” he said. “I’ts well known the [European] finals are in Edinburgh this year. Both ourselves and Glasgow have huge games this weekend. “It would be a big step in the right direction for Scottish rugby if we could both get out of the groups. “We’ve got a huge opportunity to advance in Europe but we also want to get our best finish in the Pro12 with Hodgey. I think the last time they were up in the top four was when Robbo [Andy Robinson] was here. There will be a focus on that in the next couple of weeks after we deal with Europe. The upcoming Scotland Six Nations squad announcement on Wednesday is clearly not a distraction for Weir as he said he didn’t know it was happening.